Were you thinking of getting rich of One Laptop Per Child's G1G1 sales by selling your XO -1 laptop on eBay like SIGN Foundation and Sunny East Treasures did? Well I hate to kill your sure-fire money maker, but eBay has pulled all the XO laptop ads. Is eBay, a co-sponsor of OLPC, somehow trying to protect the spirit of Give One Get One by purposely de-listing XO-1 ads? eBay permits Pre-sale listings only on a limited basis. The seller must guarantee that the item will be available for shipping within 30 days from the date of purchase (i.e., the day the listing ends or the date the item is purchased from a store front listing). The seller must also clearly indicate within the listing the fact that the item is a pre-sale item with a delivery date that indicates the item will be shipped by the 30th day from the end date of the listing. Before yesterday, no one knew when we would get XO laptops, so sellers couldn't confirm shipping dates, and that's how eBay canceled the auctions. With First Day Donor email, the eBay sellers should be able guarantee an XO availability between December 14-24. Will eBay now allow a completed XO auction? And will T-Mobile HotSpot subscription resellers start posting eBay auctions once we get confirmation codes from One Laptop Per Child? As I have said previously, it seems rather unlikely that T-Mobile would allow reselling. "3. XO laptops are available only for private home and educational uses. No XO laptops will be supplied for resale." Doesn't that mean that you can't resell a laptop on ebay anyway? Who says that XOs on ebay originated with the G1G1 program? $200 could be worth more as sustenance for food and shelter, than in the education of a child. It'd be a shame, certainly. It is too bad that G1G1 program machines are not available in a separate color, say blue, so that they were easily identifiable on ebay. I hope to use my laptop for writing a travel diary, but I expect there may be difficulties when I try to enter countries that have purchased OLPCs for their children. A provenance will be needed I think. Well, also, the sellers are very vague as to what they will be shipping, as we are too. Judging by the wording above, I do not think they will come in a "retail" like package. So there is no set items included i.e. power,documentation, etc. Even with the email sent to people, some of who admit that they were not first day adopters, there is no "set" date for them to be received by. Does anyone know when exactly they will ship;how many laptops have been produced&passed quality tests;how many people have ordered since day one; will the amount produced & allocated to G1G1 people be sufficient? I bought XO in the second week. I had a confirm# and expect delivery date Dec 26 - Jan 15. But I need it by Jan 5th for delivery to another child. I expect the OLPC to be tagged to a specific owner from the G1G1 program. From my understanding, networking access can actually be shut off. Bitfrost is the security platform for the OLPC XO. More info on OLPC wiki. On first boot, a program is run that asks the child for their name, takes their picture, and in the background generates an ECC key pair. The key pair is initially not protected by a passphrase, and is then used to sign the child's name and picture. This information and the signature are the child's 'digital identity'. The laptop transmits the (SN, UUID, digital identity) tuple to the activation server. The mapping between a laptop and the user's identity is maintained by the country or regional authority for anti-theft purposes, but never reaches OLPC. The eBay auctions grate on me because I think they run counter to the spirit of the whole G1G1 program. But setting that opinion aside, I still have some problems with those auctions and I'm glad eBay is taking them down. For starters, how can they auction something off that they haven't even got in their possession yet? I mean, for goodness sakes, at least they should wait until their device actually arrives before setting up an auction. That's just common sense. Moreover, if someone really believes in the OLPC program, as opposed to just wanting to own an XO, they'll try to obtain one via G1G1 instead of via eBay or other means. Though I suppose as long as the SELLER got their device via G1G1, a child will benefit somehow in the long run anyway, regardless of whose ulterior motives are also being served. The idea of trying to profit from XOs still bugs me, and it's still flouting the proverbial "spirit of the law", even if it's following the letter of the law. But human nature is what it is, and some people are bound to think of green US dollars before they think of green XOs. As far as auctions go, I can see that the XO agreement specifies that these devices are not for resale. However, as long as a seller is putting ONE device up for auction, I'm not sure eBay will have a valid reason to pull the auction (*after* the seller has actually got the XO in hand, that is). One private person selling one item doesn't sound the same to me as opening up an eBay store to sell XOs from. In the same vein, I think eBay would have every right to cancel the auctions of someone who's selling multiple XOs, especially if they're doing so in large quantities. Frankly, I'm surprised that eBay took this long to pull XO auctions. I'm surprised that they didn't start yanking them the moment they realized that the auctions were being set up. Better late than never, I guess. Why not write an open letter to ebay trough OLPC News? 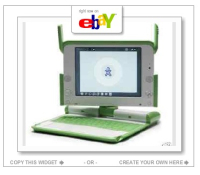 I mean, ebay is an official member of OLPC, they have to do something, don't they? I have to play devil's advocate here. A line on a website saying "don't resell this" is NOT the same as including it in a sales contract. People maybe shouldn't resell their XO but there doesn't seem to be a legal basis for preventing such sales (once the XO is physically under the seller's control, obviously). I'm not going to sell mine. But as things stand right now, it seems that I have the RIGHT to sell it, if I choose. The thought of selling this device on ebay is totally absurd. Has the OLPC greed surpassed that of the much coveted iPhone? Bottom line is they can write whatever they want on their web site (that's their right under the Constitution) but I doubt they can restrict anybody from reselling it on ebay as long as you comply with the law. OEM software is an example. The software industry association has tried very hard to get ebay to stop people from selling oem software with no luck. ebay hasn't put up with this. The upside to eBay auctions: they drive up the overall demand, or (even if you don't buy that) they extend the effective length of the period of availability, in that some people will order more XO laptops than they expect to have personal use for in order to sell them on eBay. I personally am disappointed (the cup is always half-empty, and leaking) that the XO isn't just being made wildly available to all comers -- but specifically, I wish there would be another sale period sometime soon after the first, because I bet the biggest / best ad campaign for the donationware program is going to be the first wave of users in the U.S. and Canada (primarily), but at that point it will be too late. Note: I am glad for the G1G1 program; I was afraid that there really would never be any public availability, and some is better than none. I can still harrumph about the details, doesn't mean I'm ungrateful. The G1G1 program will be *over,* just when people get to see their friends, family members and coworkers with the device, and get sold not only on the thing as an artifact but on the possibilities it offers for the educational programs which inspired it. At that point, I think / hope that people who bought more than one of them in the hopes of selling some number of them on eBay or similar are able to, justifying their increased donation-purchases. Case in point: My mom wants one now, so I'll be ordering one for her -- makes me laugh, but a happy rather than derisive laugh -- and she will be a funny use case, but I bet she will be asked by several dozen people about the cute green computer. What she won't be able to tell them is where to buy one! The other good thing about the eBay sales is that people, from here I guess, made sure to post entries pointing to laptopgiving.org. T. Lord, I was thinking the same thing today as I sat at a WiFi hotspot with a prototype XO. I've done this a dozen times recently, and every time one or more people came up to me to ask about the XO because they had heard about it in the media. I'm sure I closed a bunch of laptop sales. Imagine if 50,000 of us used the XO with our free T-mobile Hotspot access just in the month of January 2008. OLPC could easily rack up 50,000 more sales. Well, I think those of us who do have the laptops by Xmas should spend some time in the last week of this year at T-mobile Hotspots doing demos for the cause. I think the XO's should ship with a card/sheet with info on the XO that you can hand out to people. Heck, if 5 people G1G1 with your referral number, than they will donate an extra laptop to somewhere. THAT would raise awareness. Or maybe some other referral type program. It would target people who would be interested by direct word of mouth. It is Ebay's website...they can not allow anyone they want to sell/no sell whatever they want. The Ebay story is secondary, the main point is that Negroponte didn't even want the computers in America and battled against the G1G1 program from the beginning. In the end he compromised with the 2-week (and subsequently extended) ordering window. I am a first day donor. I plan to play with mine for a couple of days, then auction it off on eBay, donating the proceeds to OLPC. I hope the auction winner will do likewise. We can pass the machine around, play with the new tech, and raise some money. I hope that doesn't violate the spirit of the program. I'm guessing that everyone here is in the US or Canada. I'm also trying to develop software for the OLPC, and it's really tough when there is no way that I can have access to a machine I am writing code for. Ebay was my only hope, and I really hope that I will find one up there soon. XO laptops - the low-cost computers geared for kids in developing countries - are fetching a pretty penny on eBay. The computers, which have a signature green-and-white case and a customized version of the Linux operating system, have a nominal value of about $188. One Laptop Per Child (OLPC), the non-profit that designed and distributes them, is offering them to Americans in a limited program for about $425, including shipping charges and a required $200 donation. But in recent bidding on the auction site, consumers have agreed to pay as much $600 for an XO with shipping. And nearly all of the XOs sold on the site have gone for more than $250.